For the first time ever, Digidesign's Pro Tools recording software is available as a stand-alone product, which can be used in conjunction with any of five audio interfaces from M-Audio. From humble beginnings as Midiman, makers of handy gadgets such as format converters and MIDI interfaces, M-Audio's growth is the stuff of business legend. By the time the company was bought by Avid Technology last year, sales of M-Audio's core products — affordable soundcards, USB and Firewire interfaces, and controller keyboards — were bringing in tens of millions of dollars. The motives behind Avid's acquisition seemed pretty clear: Digidesign, also owned by Avid, had reached a dominant position in the pro and semi-pro markets, whilst M-Audio were one of the leading players in the home-studio computing arena, so the takeover gave Avid a substantial slice of the latter market to complement Digidesign's dominance at the higher end. There was, however, a certain amount of overlap between the new siblings' product ranges. In recent years, Digidesign had devoted increasing attention to their Pro Tools LE systems, which package a slightly cut-down version of their Pro Tools recording software with small audio interfaces such as the M Box and 002, and some of these have very similar counterparts in M-Audio's range. The takeover thus led to plenty of speculation about how the two companies would work together. Would Digidesign make an ASIO-compatible version of Pro Tools? Would M-Audio continue to bundle other companies' software with their interfaces? Would we see the end of open driver support for M-Audio hardware? Those who were hoping for an 'open' version of Pro Tools will also be disappointed. PT M-Powered uses the existing M-Audio device drivers, provided you have the latest version, but is unable to 'see' any audio devices other than the five listed above. Previous versions of Pro Tools have, in effect, used Digidesign's hardware as a dongle, with PACE's iLok system employed as an adjunct for authorising third-party plug-ins. In Pro Tools M-Powered, the iLok USB dongle is used for the program too. It's hard to love any dongle-based copy-protection scheme, but the iLok system is at least tried and tested, and it makes it possible to gather all your plug-in authorisations in one place; it also allows you to install a single copy of Pro Tools M-Powered on as many different machines as you like, as long as you only intend to use one at a time. However, the sheer physical size of the thing can be a nuisance — the two USB ports on my laptop are positioned in such a way that it's impossible to insert a USB pen drive at the same time as the iLok. The Mix window in Pro Tools provides a standard 'virtual mixer', although nearly all of the same functions can be accessed from the Edit window. As well as the dongle itself, which comes in a fetching shade of red, the box includes Windows and Mac installation CDs, a brief Getting Started manual and an even briefer Basics Guide. These are reproduced in PDF form on the discs, along with the full manual and various other bits of documentation. I've always found Digidesign's product manuals, especially the Pro Tools Reference Guide, to be among the best around, but it would be handy to have this in paper form too. It would also be nice if the Reference Guide had been updated to cover Pro Tools M-Powered, which has been given the version number 6.8 — the Reference Guide is for 'version 6.7 for HD and LE systems', and doesn't include any info specific to the M-Powered version. The LE and TDM versions of Pro Tools have just been updated to 6.9, but the new features in that version don't appear in Pro Tools M-Powered. The DV Toolkit, which allows Pro Tools LE users to import project files from Avid's Xpress DV video-editing package, is not supported here. Pro Tools M-Powered does, however, include the major features that were added to the LE version in the 6.4 and 6.7 updates, including the Beat Detective LE drum-fixing tool, and for those who might want to bring their projects into a larger studio at a later date, it is fully Session-compatible with LE and TDM systems. The idea that you can take your hard drive into almost any studio in the world and have your recordings ready to mix or overdub will be a major selling point. I tested Pro Tools M-Powered on a Centrino laptop running Windows XP, with an M-Audio Firewire 1814 interface. Installation is fairly straightforward, and although it does demand a couple of tweaks to System Properties settings, the manual does a fairly good job of holding your hand through the process. Getting your M-Audio interface up and running with Pro Tools requires that you install the WDM driver, which is equally straightforward. Plug the iLok key in, navigate the Found New Hardware wizard yet again, and you're ready to go. These days, it seems that no self-respecting MIDI + Audio recording package can be competitive without the sweetener of free effects and processors, and Pro Tools M-Powered is no exception. The standard Digirack suite of basic plug-ins has now been swelled to 35 items, to which those with an Internet connection can also add the new EQ III (see this month's Pro Tools Notes). It's probably best not to get too excited about such thrillers as DC Offset Removal and Normalize, but most of the Digirack tools will come in handy sooner or later. The compressors and equalisers are usable, if not exactly characterful, and D-Verb is more versatile than most bundled reverbs. All the dynamics plug-ins can be keyed from any of the internal busses in the Pro Tools mixer — an invaluable feature which is sorely lacking in most MIDI + Audio sequencers. What's more, all the real-time plug-ins are also available in off-line Audiosuite versions, and if you run out of processing grunt, it's always been easy to copy your settings from the one to the other and apply them permanently. Perhaps Digidesign should give this function a snowflake logo and a catchy name — something like 'Freeze' should do the trick. As with all current versions of Pro Tools, you also get a selection of plug-ins from the Bomb Factory line, which was bought up by Digidesign a whille back. Most of these fulfil useful but unglamorous functions such as clip removal and metering; the highlight for most users will be BF76, a recreation of the classic Universal Audio 1176 compressor. I think I prefer Universal Audio's own software recreation of this unit, but since you'll need to fork out for a UAD1 card or a TDM system in order to use that, BF76 is not to be sneezed at. Also included on the CD is Ableton's Live Digidesign Edition, but the other 'lite' programs bundled with LE versions of Pro Tools are absent here. Propellerhead's Reason Adapted is bundled with most M-Audio hardware in any case, but it's a shame that you don't get IK Multimedia's Sampletank SE, Amplitube LE or T-Racks EQ. The basic features of Pro Tools have been covered in SOS many times before, so I won't go into detail here except on points that are specific to the M-Powered version. 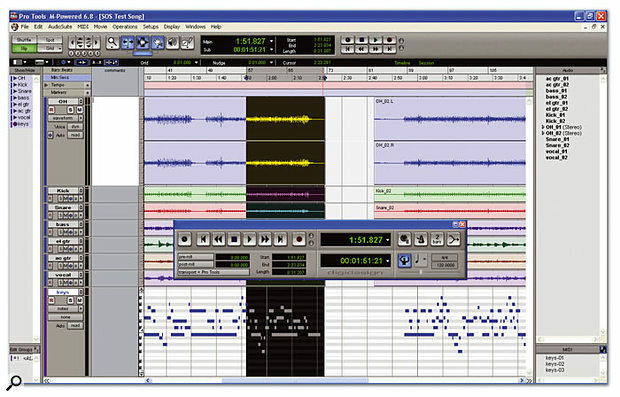 As ever, almost all recording and editing functions are carried out in one of two windows: the Edit window shows each track arranged along a horizontal timeline, while the Mix window displays the same tracks as channels in a virtual mixer, with faders, pan controls, aux sends, inserts and so on. Seasoned Pro Tools users will know that you can actually accomplish almost everything within the Edit window, which makes a welcome change from those applications that open a new window if you so much as sneeze at them. Even MIDI note editing is carried out directly within MIDI tracks in the Edit window, with no need to open up a separate piano-roll screen. Audio can be recorded at 16- or 24-bit and at sample rates up to 96kHz. Unlike most DAWs, Pro Tools doesn't include any template setups for typical tasks like multitrack recording or stereo editing, so the first time you start it up and open a new Session, the Edit and Mix windows will be blank until you create tracks to fill them. You can have up to 128 mono or stereo audio tracks, but like current LE versions, PTMP provides only 32 'voices' — playing back a mono track requires a single voice, whilst a stereo track will use two — so 96 of these must be considered 'virtual' tracks. Aux inputs and MIDI tracks also appear in both the Edit and Mix windows, and a Session can include up to 256 of the latter. As well as audio and Aux tracks, there are also 16 mono audio busses, which can be paired to make up to eight stereo busses as appropriate. The output of any track can be routed either to an output on your audio interface or to a buss, and each track also features five Aux sends which can likewise be routed to any output or buss. Aux input tracks can be fed from any audio input or any buss, and if you want to have three aux sends feeding one half of a stereo Aux track and two feeding the other, before sending from that Aux track to the key input of a plug-in on another track and routing all of the resulting mess to another buss feeding another Aux track, no problem. To my mind, the flexibility of this bussing system is one of the strongest features of Pro Tools, and this alone would be enough to make me choose it over most other MIDI + Audio applications for mixing. Once you've created some tracks, they should be available for recording straight away, with input and output routings automatically assigned by Pro Tools and visible in its mixer. As far as the M-Powered version is concerned, however, there seems to be a tiny fly in the ointment. When I booted it for the first time, I was able to select inputs only on stereo tracks — whenever I created a mono track, all the possible inputs were greyed out. After a bit of head-scratching I traced the problem to the I/O Setup window. Channel inputs and outputs within the Mix window are selected from a list of Input Paths and Sub-paths, and the I/O Setup window is where you create these Paths and assign them to physical inputs and outputs on your M-Audio hardware. For some reason, the Pro Tools mixer won't allow you to select one side of a stereo Path as an input source or output destination for a mono channel; instead, you need to manually create a mono Input Path or Input Sub-path within the I/O Setup window. This means that the natural way to set things up is to use a stereo Input Path for every pair of inputs, with mono Sub-paths for each half of each stereo Path. ...but more often than not it fails to do so, as shown here. This has always been the default in my TDM system, and according to the Reference Guide, the same should be true of Pro Tools M-Powered — there's even a dedicated Default button which is supposed to return you to that state. In my system, though, the default setting most often created a stereo Path for each input and output, but no Sub-paths (I say 'most often' because sometimes it did work properly on the inputs, though never with the busses). The upshot of this is that no mono inputs are available for selection within the Pro Tools mixer; and likewise, no mono destinations are available on Aux sends. 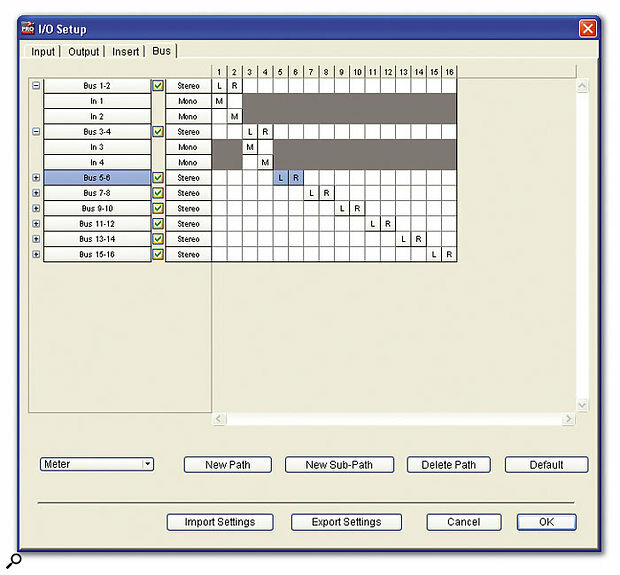 This problem is easily resolved by visiting the I/O Setup page and manually creating some mono Sub-paths, but if it's reproduced on other machines, I think Digidesign's tech support people can expect a few calls from frustrated first-time users. 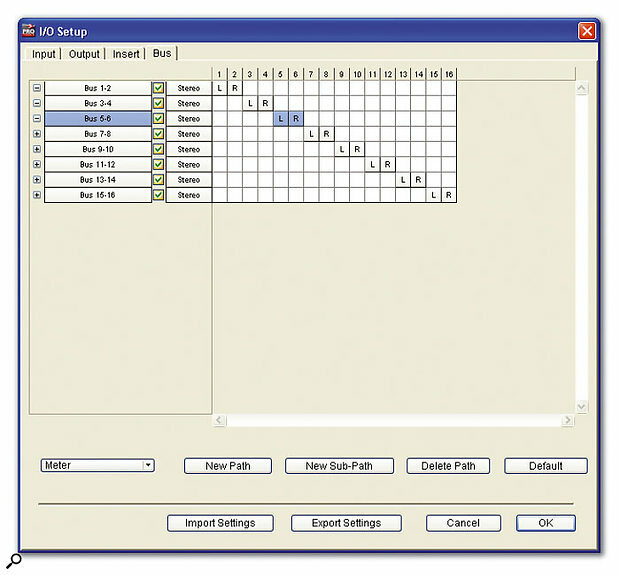 Routing and mixing are handled entirely in Pro Tools M-Powered rather than the M-Audio Control Panel — fader settings in the Control Panel mixer have no effect in PTMP— but you do need to visit the Control Panel in order to carry out some tasks, such as switching the format of an interface's digital I/O. Annoyingly, anything that does have to be done in the Control Panel requires that you quit out of Pro Tools in order to do it, though the same is true of any other audio application running with M-Audio hardware. What will be more annoying for many users is that the Direct Monitoring options in interfaces such as the Firewire 1814 are not supported in Pro Tools M-Powered. In other applications such as Cubase SX, these allow you to route input signals directly to the interface's outputs with negligible latency, so that you can hear what you're playing without the aid of unwanted slapback delay. Pro Tools LE provides a similar function with the 002 interface, but unless you have a hardware mixer or similar that you can use to set up an all-analogue monitor path, you'll will be stuck with the Elvis effect when recording in Pro Tools M-Powered. At the default 512-sample buffer size, the latency will certainly be noticeable, and the smallest buffer size available is a rather conservative 128 samples, which equates to a latency of around 6ms at 44.1kHz — the 64-sample setting available to other applications with M-Audio hardware is absent from Pro Tools. Pro Tools is a versatile piece of software, but its central application is still recording, editing and mixing multitrack audio, and I took the opportunity to test the M-Powered version in a real session. For a while now, I've had my eye on an attic room at my dad's house, which I had always thought would make a beautiful acoustic environment for tracking a band live. (The difficulty had always been finding musicians foolish enough to let me do this, but I solved this problem by starting a band of my own.) As luck would have it, the review copy of Pro Tools M-Powered turned up the day before our session, and — throwing caution to the winds — I decided to press it into action. We encountered more than our fair share of problems on the day, the low point being a power glitch which took out an eight-channel analogue-to-digital converter and a ring main. Forced to rely only on the Firewire 1814's unbalanced analogue inputs, we then ran into horrendous ground-loop interference, and the only way we could record anything at all was to disconnect the laptop from the mains and run it on battery power. Despite all of these setbacks, Pro Tools M-Powered held up pretty well under pressure. The input routing anomaly described above caused a certain amount of cursing, and I also became frustrated with how long it took to open even a fairly simple Session with few tracks and no recorded audio. When it really mattered, however, Pro Tools M-Powered delivered the goods, recording eight tracks of audio and a MIDI keyboard without any fuss. Even when my laptop was on the verge of giving out, PTMP was faithfully capturing the 'low battery' beep, and although the interface became a little sluggish, every single take was recorded perfectly. Pro Tools M-Powered has not crashed once since I've installed it, and has behaved as predictably and reliably as you'd hope. Internet folklore has it that the Windows version is inferior to the Mac original, but I experienced nothing to suggest that this is the case. Whereas programs such as Logic began life as MIDI sequencers and added audio recording at a later date, Pro Tools has gone the other way. It was originally an audio-only package, but its MIDI capabilities have come on in leaps and bounds in recent years. MIDI recording in Pro Tools M-Powered is a piece of cake. When you create a MIDI track, it defaults to accepting input from any connected device — simply arm the track and play a few notes, and you should see the incoming MIDI data light up the track's meter. Pro Tools M-Powered detected both the MIDI ports on the Firewire 1814 interface and a connected Edirol PCR1 USB keyboard without any intervention at all on my part; and if you need to create a more complex MIDI environment, the MIDI Studio Setup window is only a mouse-click away. Under Mac OS X, the same functions are accomplished using the standard Audio MIDI Setup utility. To use virtual instruments in Pro Tools, you simply create an audio track or Aux track and add the instrument of your choice as an insert plug-in. That plug-in should then appear as a possible destination in the Output pop-up on MIDI tracks. I say 'should' because I experienced a few anomalies in this regard. Arturia's CS80V was happy to load in to an audio or Aux track, and could be 'played' via its on-screen keyboard, but didn't show up as a destination in MIDI tracks, while IK's Sampletank LE unaccountably refused to accept input on MIDI channel 1. Whether these problems were down to Pro Tools itself or poor implementation of the RTAS standard on behalf of the plug-in developers, I don't know. I've been an unapologetic Pro Tools fan for a long time now. Where other software fills the screen with flashy graphics and cryptic icons, Pro Tools presents only the information you need to know, in a way that I find perfectly intuitive. Its two-window design is supremely elegant, its editing tools are powerful and quick to use, its mixer is one of the most flexible around, and you have to kick it pretty damned hard to get it to fall over. I'll take those basic qualities over fancy bundled synths or loop-mangling tools any day of the week, and now that Pro Tools M-Powered has made them available on a much broader range of hardware, what's not to like? Well, it is slightly disappointing that the integration between Pro Tools and M-Audio hardware is, in some ways, less complete than you get with an ASIO-based application such as Cubase SX. I doubt that too many people will be bothered by PTMP 's inability to record at 192kHz, but its lack of support for Direct Monitoring is unfortunate, given that Pro Tools is perfectly capable of making use of the same feature within Digi's 002 and 002 Rack hardware. It might be that the port to M-Audio hardware has been a little rushed — some of the windows within Pro Tools M-Powered still say 'Pro Tools LE' at the top — but at least the features that are included work, and work well. Whilst Pro Tools M-Powered does open up welcome new hardware options for Pro Tools devotees, though, I can think of one group of users who will remain frustrated. M-Audio interfaces such as the Firewire 410 and Audiophile PCI cards fill some of the gaps in Digidesign's hardware range, but I can't be the only Pro Tools user who dreams of editing and mixing on my laptop using a slimline PCMCIA audio interface, rather than having to cart around an M Box or a Firewire interface and all its associated cables and power supplies. The likes of Echo's Indigo range and Digigram's VXpocket cards make this possible for those using ASIO-based software, and it's about time Digidesign or M-Audio produced something comparable. Existing Pro Tools users who want to move to M-Audio hardware might also feel justifiably aggrieved at having to pay full price for the M-Powered version of a program they already own. The cheapest of Digidesign's LE systems is the M Box, which still retails at over £300 in the UK, when other USB interfaces with almost identical hardware features, including M-Audio's own Mobile Pre USB, are available for little over £100. M Box owners have, in other words, already paid £200-plus for their copy of Pro Tools LE — so is it really fair to ask them to spend the same amount again, just in order to use the same program on a Firewire 410 or Ozonic? After all, if you're a Cubase user and you decide to upgrade your audio hardware, you don't need to hand over any extra cash to Steinberg. Personally, I would hope that existing users' loyalty to Pro Tools would earn them at least a substantial discount, but Digidesign evidently don't agree. Ten years ago, the idea that one might actually want to pay money for a copy of Digidesign's editing and recording software would have seemed crazy to a lot of people. 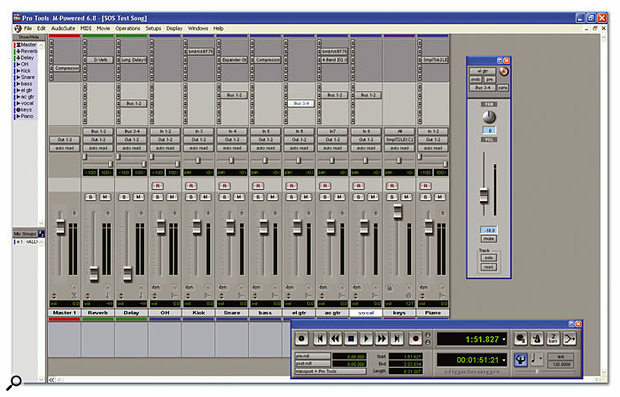 Sales of TDM systems were driven by the hardware, with its unique low-latency, DSP-assisted mixing capabilities, and most of those using Digidesign hardware in a music-recording context left the software in the box and ran Logic or Digital Performer as a front end. The fact that Digidesign are now able to charge £239 just for a copy of Pro Tools shows how much things have changed since then; and the fact that all those other programs have spent the intervening decade growing steadily more similar to Pro Tools tells you even more. It's not the most visually exciting piece of software, and it still lacks some of the advanced MIDI features available in rival products, but in terms of simplicity, intuitiveness and flexibility — not to mention stability — it's hard to beat. Pro Tools M-Powered is simply the latest iteration of a mature, stable and comfortable recording program, and the fact that it exists is a powerful reason to consider M-Audio hardware over the alternatives. The feature set is almost exactly the same as in the LE version, and at £239, it's in the same price range as Steinberg's Cubase SL, Apple's Logic Express and Cakewalk's Sonar Studio 4. Whether you're already a Digidesign diehard or someone who's in the market for recording software for the first time, you simply can't afford to ignore Pro Tools M-Powered. Increases the range of hardware options available to Pro Tools users. Provides users of M-Audio hardware with the option to use one of the best recording packages around. Fully Session-compatible with other Pro Tools systems. No crossgrade deals for existing Pro Tools LE users. Doesn't support Direct Monitoring on M-Audio hardware. Not compatible with the DV Toolkit, and doesn't include the new features in Pro Tools 6.9. There seems to be a bug in the I/O Setup window that fails to create mono Input Paths. There's still no PCMCIA interface that can be used with Pro Tools. If you own a compatible M-Audio interface, you can now add the industry's standard DAW to the equation when choosing your recording software; and if you're an existing Pro Tools user, you can now choose from a much wider range of recording hardware — if you're prepared to pay for another copy of Pro Tools to go with it.